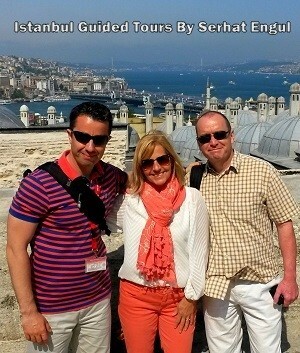 The Old City of Istanbul attracts attention with its great spots to dine. Apart from meatballs, doner, and kebab, which are indispensable parts of the Turkish kitchen, there are also some Ottoman restaurants that reflect the Ottoman Empire’s hundreds of years of food culture in Sultanahmet. 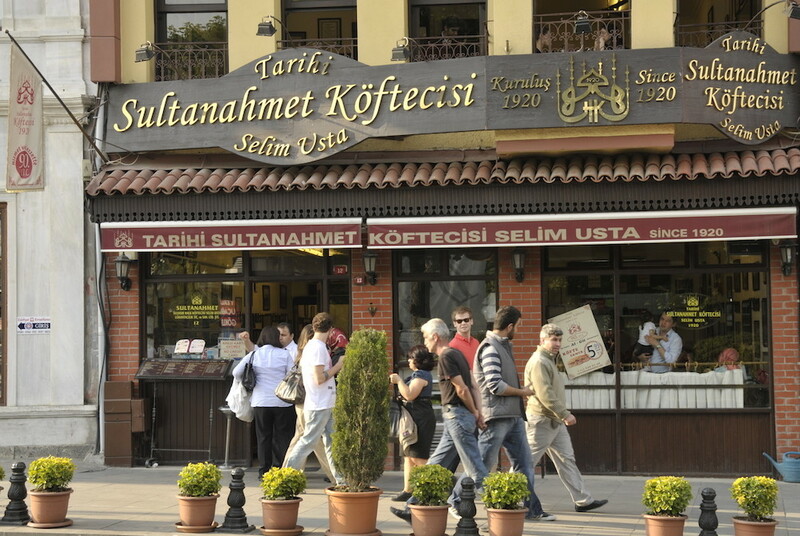 To that end, I’ve listed the best restaurants in Sultanahmet area in this post. While you visit famous landmarks like Hagia Sophia, Topkapi Palace, and Grand Bazaar, you can turn your trip into an unforgettable gourmet tour. Deraliye Restaurant is a 35 years old establishment at Sultanahmet and it serves customers traditional Ottoman cuisines. 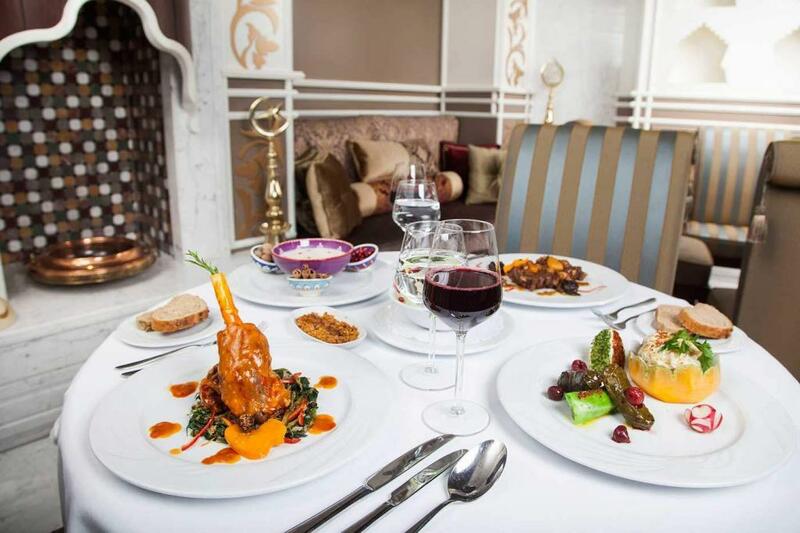 Original recipes from the countries that influenced Ottoman kitchen are followed at Deraliye Restaurant. Therefore, you can find dishes from Central Asia, Iran, Anatolia, and the Balkans at this restaurant. Traditional palace delicacies that were served to the Sultan, Valide Sultan, and their guests would be prepared meticulously. And Deraliye Restaurant, as one of the few Ottoman restaurants in Istanbul, promises you a time travel to the Ottoman era kitchen. At Deraliye, you can find stuffed grape leaves with cherries, stuffed cabbage with chestnuts and stuffed sudak fish from Mehmed II era. 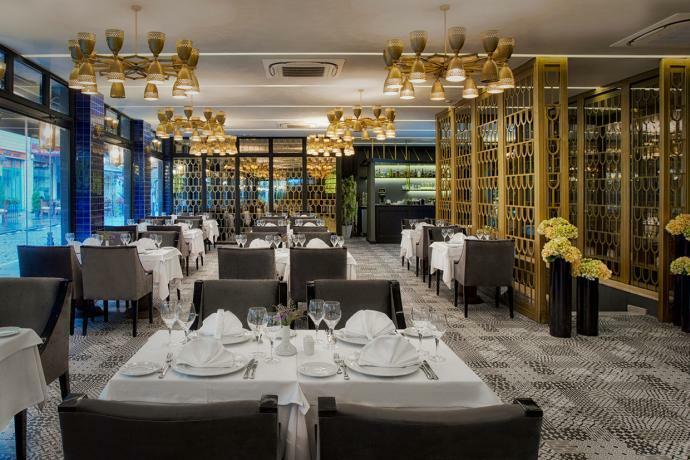 As it’s one of the popular restaurants among both local and foreign visitors alike, Deraliye Restaurant finds a place in the list of best restaurants in Sultanahmet. Matbah Restaurant is an expert on Ottoman kitchen, but it’s equally popular for its Turkish dishes. And the menu names at Matbah Restaurant have special ones such us Dersaadet or Istinbolin. In these menus, special examples of Ottoman kitchen, such as almond soup, lamb neck stew with plums, imam bayildi (eggplant stuffed with onion, garlic, and tomatoes), balli gemici boregi (pastry with cheese and honey), nirbac (lamb’s quarter and lamb meatballs with carrot stew), hibes (appetizer made of tahini, lemons, cumin, garlic, salt, and pepper powder) can be found. Additionally, special dishes made with beef, chicken, and fish are also included in the menu of Matbah Restaurant. In the a la carte menu, you can try cold and appetizing starters like baba ghanoush and stuffed calamari with shrimps. Apart from traditional Ottoman cuisines, there are dessert options you can crown your meal with. Almond halva, rice pudding with gum, and baklava are the dessert options at Matbah Restaurant. In Matbah’s summer and winter garden, you can have group meals. Moreover, you can listen to classical Turkish music played with oud while you dine on Friday and Saturdays. This almost a hundred year of establishment was founded by Mr. Mehmet Seracettin in 1926 and its first name was ‘Turan Kebapcisi’ when it was first opened on Divanyolu Street at Sultanahmet. Meatball mixture is made of fine ground beef, a little bread crumbs, salt, and onion at this restaurant. And this special meatball has already so many fans and regulars. In time, the shop was renamed as ‘Halk Kebapcisi’ and ‘Meshur Halk Kebapcisi, but it was named “1920 Sultanahmet Koftecisi” as the permeant one. The meatballs served at this shop are accompanied by classical and delicious haricot bean salad and pilaf. Apart from meatballs, lamb on skewers is in the menu too. 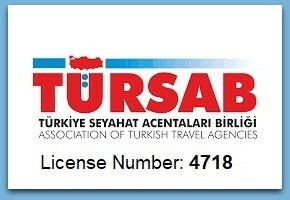 Apart from franchising all around Turkey, its first branch abroad was opened in Baku, the capital of Azerbaijan. Then, Munich, Nurnberg, Manchester, and Famagusta Citymall branches followed. 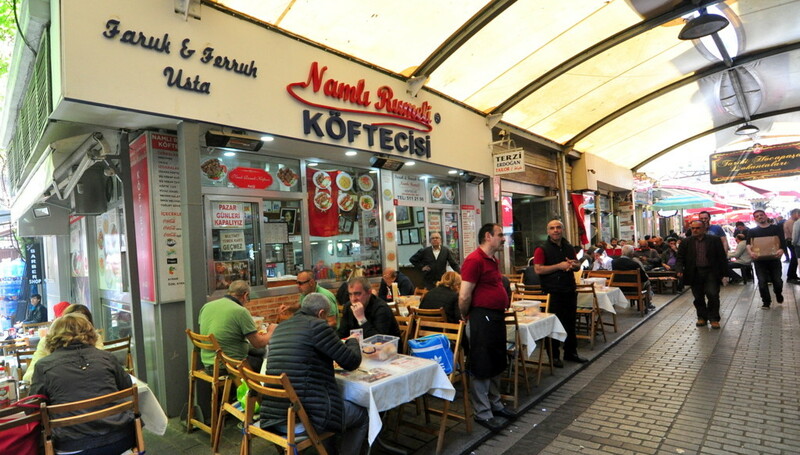 Namli Rumeli Koftecisi was opened in 1982 at Hocapasa in Sirkeci. If you wish to start your meal with soup, you can go for either lentil soup or yogurt soup. Also, home-made ayran at Namli Rumeli Koftecisi is really delicious and definitely worth trying. This shop is famous for its meatballs, but you can opt to have chicken skewers or lamb skewers too. Moreover, haricot bean salad and classical salad at Namli Rumeli Koftecisi are equally tasty. And after your meal, you can have semolina halva as dessert. Can Oba Restaurant is an alcohol-free restaurant, located at Hocapasa and it’s a must-visit place if you are a seafood lover. It’s a small restaurant with only five tables, but it’s getting more and more popular. Fish soup is made in an unconventional way here. Fish soup is made with seafood like calamari or sand mussel instead of fish. Additionally, in its menu, you can find such seafood choices as salmon salad, risotto with squid, clam on spinach bed, as well as kebab options. The chef of the restaurant is Can Oba, who previously worked in Michelin star restaurants before. 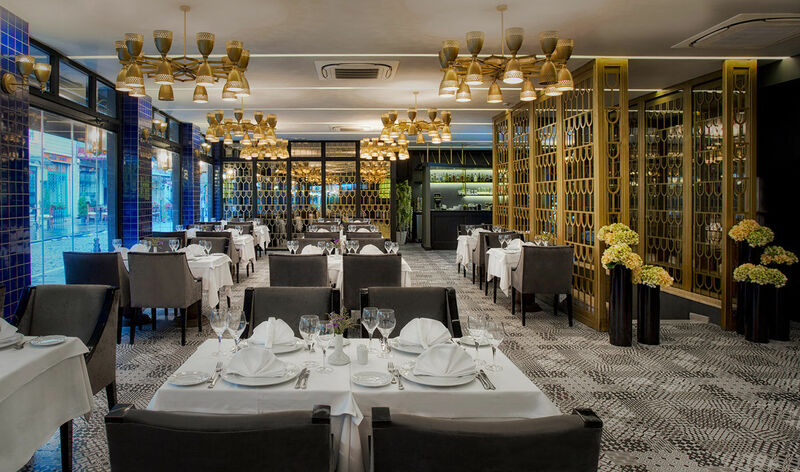 The dishes in the menu vary on daily basis and Can Oba Restaurant is regarded as one of the best restaurants in Istanbul by many gourmets and therefore, it finds itself a place in our list of the best restaurants in Sultanahmet. 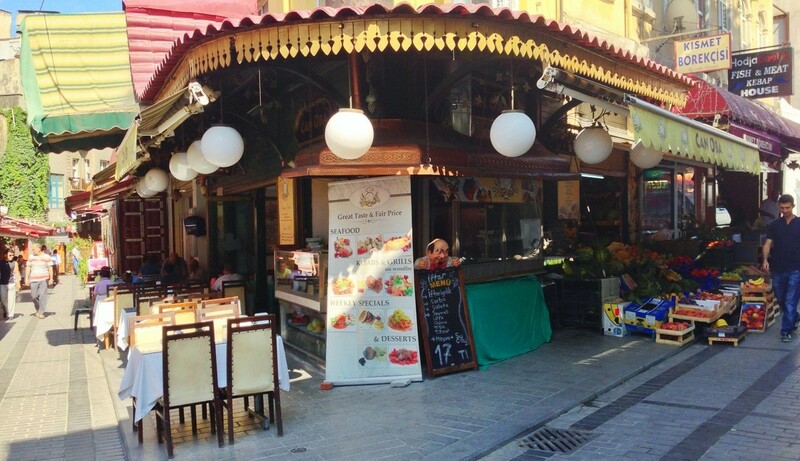 Seyhmus Kebap Salonu is on Medrese Street at Cemberlitas, which is only 5 minutes walk from Sultanahmet. 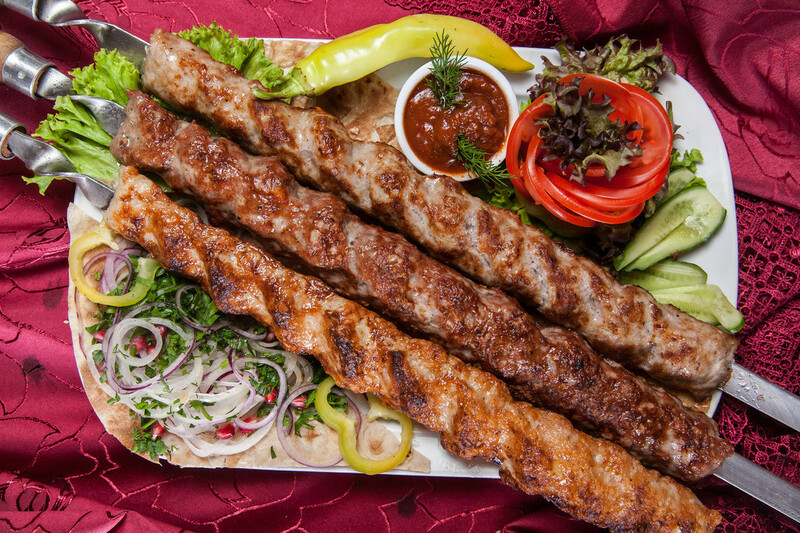 This place is a real deal if you want to have some good quality kebab such as Mardin kebab or Seyhmus’ special kebab options. Kebab at Seyhmus Kebap Salonu is made of beef that is turned into ground beef with a knife instead of ground beef machine and your kebab is served with spicy ezme, bulgur pilaf, grilled tomatoes, grilled peppers, and onion with sumac. This shabby looking restaurant is the place where you can eat any of the kebabs in its menu and you won’t regret doing so. Also, you can have tel kadayif (shredded phyllo) after your meal at Seyhmus Kebap Salonu. Boris’in Yeri is nearby Kor Agop, one of the oldest meyhanes at Kumkapi and this place was opened in 1936. The founder and the former owner Mr. Boris passed away in 1996, but its food quality is still maintained. The place is open from 06:30 to 22:30 every day and you can have breakfast here at any time of the day. You can have your egg in any way you like and kaymak (creamy dairy product made of cow milk) is produced in the shop. 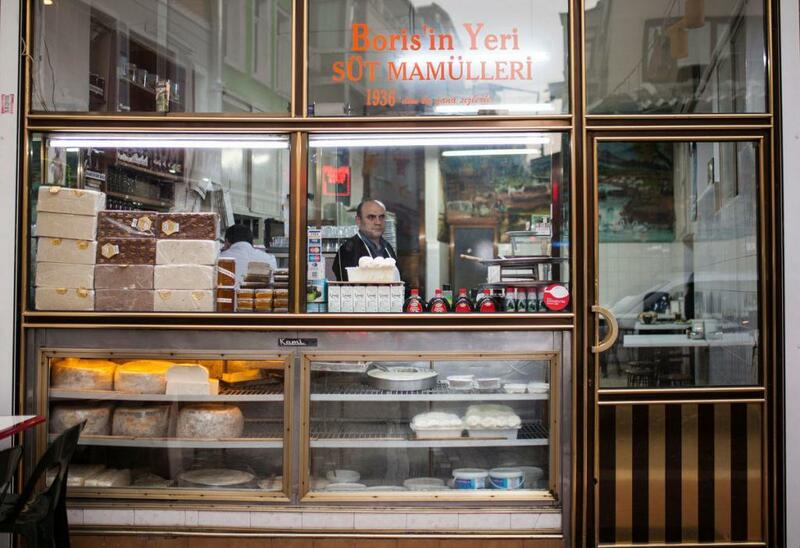 As its white cheese is really good too, meyhanes in the area buy cheese from Boris’in Yeri. In its menu, important items of Turkish breakfast such as kavurma (fried or sautéed meat), sucuk (Turkish sausage), and salami as well as delicious sweet options like tahini, pekmez (condensed fruit syrup), and halva are worth trying. This place is famous for its dairy products. Therefore, milky desserts like tavuk gogsu (Turkish milk pudding made with shredded chicken) and ekmek kadayifi (bread pudding) are highly recommended. Guvenc Konyali has four branches in Istanbul. 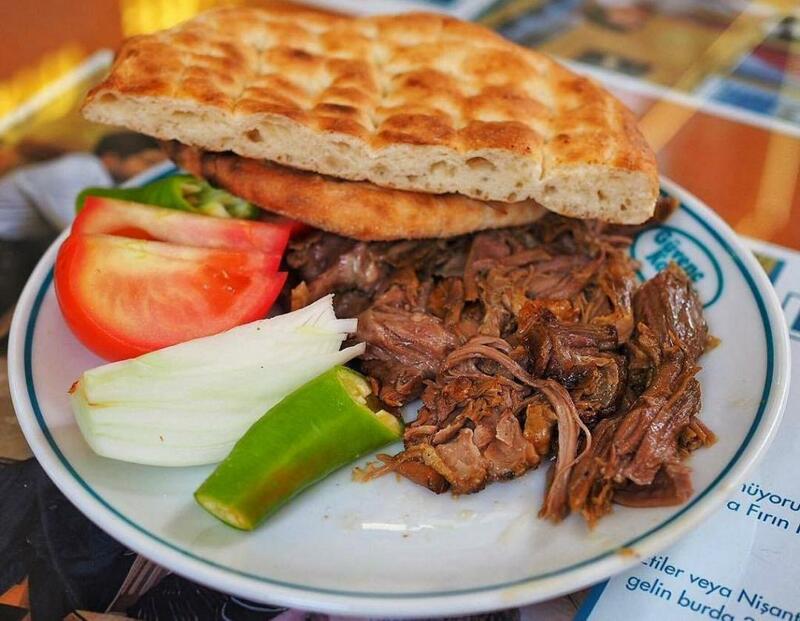 It includes a classical Konya delicacy, gumbo soup and other local food like etli ekmek (a pizza-like food) and tandir (roasted lamb). They are so good that they are as delicious as the ones in Konya. The most famous branch of Guven Konyali is the one at Sirkeci. The owner of Balikci Sabahattin from Mudanya took over the business from his father and managed it for years. As the fame of the restaurant spread, the restaurant moved to an old building constructed in 1927 after it was renovated by Armada Hotel at Cankurtaran. Balikci Sabahattin knows both the sea and the seafood very well and in its special menu, you can have mussel pilaf, crunchy fried zucchini, and roasted anglerfish. Donerci Sahin Usta is located at Beyazit and you can come across a long queue in front of the shop, especially at lunchtime. The shop was opened in 1979 and it is nearby Grand Bazaar too. Therefore, if you happen to be nearby the shop, you should definitely try Donerci Sahin Usta. Donerci Sahin Usta has been in service for 40 years and its regulars never neglect to have doner there as it’s so good. 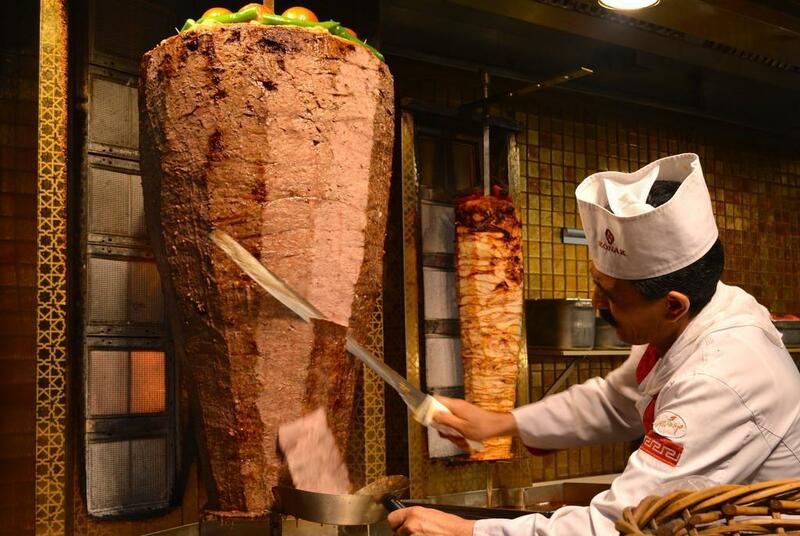 Sahin Usta (Chef Sahin) claims that he is the inventor of doner in pita in Turkey. After working in various shops before, he opened his small shop at Beyazit. Although he lost his life in 2010, the taste of doner in his shop is still marvelous.